Donald Trump has responded to North Korean Foreign Minister Ri Yong's UN General Assembly speech with threats that Kim Jong Un "won't be around much longer." MOSCOW (Sputnik) — US President Donald Trump went on to exchange threats with Pyongyang on Sunday, referring to the country's leader as "Little Rocket Man" again. "Just heard Foreign Minister of North Korea speak at U.N. If he echoes thoughts of Little Rocket Man, they won't be around much longer!" Trump wrote on his Twitter page. 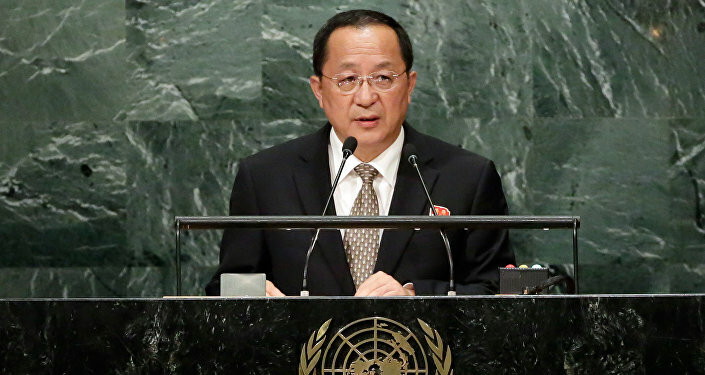 ​On Saturday, North Korean Foreign Minister Ri Yong Ho said in his address to the UN General Assembly that Trump would face the negative consequences of his remarks about North Korea and its leader Kim Jong Un. In particular, the Minister said that Trump's policy would make "our rockets' visit to the entire US mainland inevitable all the more." North Korea Says Nuke Launch at US "Inevitable"
Tensions between the two states have escalated recently, with the countries' leaders regularly exchanging harsh statements. North Korean leader Kim Jong Un on Thursday accused US President Donald Trump of exhibiting "mentally deranged behavior" and threatened Washington with a harsh response to the latest US actions against Pyongyang. Kim's statement came after Trump's first major UN speech, during which he called the North Korean leader a "rocket man" on a "suicide mission" and again warned Pyongyang that his country would be totally destroyed if it attacked the United States or its allies. North Korea has been continuously performing missile launches and nuclear tests, all conducted in violation of UN Security Council resolutions. The most recent test was made on September 15, when North Korea launched a ballistic missile, which flew over Japan before falling into the northern Pacific some 20 minutes after the launch.